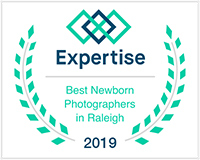 Newborn sessions take place in Melissa’s spacious, comfortable studio in Wake Forest, NC (with easy access to I-540, Capital Blvd., and 98). Sit back and relax, take a nap, feed baby in the private nursing room, enjoy cable TV and wi-fi, as well as snacks, coffee and cold beverages while Melissa works with your baby. Coming to her studio means there’s no need to clean your house or do anything at all to prepare — it’s nice & simple and the best situation for new Moms and Dads! Your newborn session includes Melissa’s time and expertise in baby posing, the beautiful styling of your session, as well as access to her massive collection of props (hats, headbands, baskets, buckets, blankets, etc. etc. ), and custom retouching of your portraits. For your convenience, Melissa now offers two newborn session options! The full newborn session is ideal for those who would like a wide variety of setups and photos. These sessions are also great for those who desire family and sibling photos taken with the baby. The full sessions last approximately 2-3 hours, and will include many different poses and setups. Following the session, an online gallery will be available to you to view your proofs. At that time, you decide which prints, digital files, and other products best suit your needs. Print packages start at $650, digital file packages start at $550. A la carte prints, products and digital files are also available. The mini newborn session includes a one-hour photo session for babies up to about three weeks old. Melissa will pose your baby in as many different setups as time allows. These sessions typically include a prop shot (basket/bucket), and a few poses on a blanket, with a good variety of angles and different hats/headbands/wraps included. These shorter sessions are for babies only, and do not include any family or sibling photos. The mini session is budget friendly, and ideal for those looking for a shorter session. Following the session, you’ll receive a download of all of your session’s fully edited, high resolution digital files (approx 15, sometimes more) for your printing and sharing pleasure! A $200 deposit is due at the time of booking, and the remainder is due at the time of the session. Please email Melissa at melissadevoephotography@gmail.com for a detailed list of product prices.